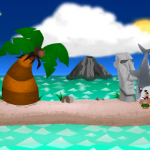 Back at the beginning of February I reviewed a little app called Pocket God. You can take a look at my previous review here: http://iphoneappreviews.net/2009/02/08/pocket-god/. At the time the app held a lot of promise, but was not fully developed enough for me to really endorse. Since that time Pocket God has climbed its way up to become the top paid app in the App Store. I have become a big fan of this app as well, and eagerly wait for each new update. The key to Pocket God’s success lays primarily with the steady updates. Updates have been arriving about once per week, and there have been five updates since I first reviewed Pocket God, hence my updated review. These updates expand the capabilities of app and broaden the experience. If you are one of the few who haven’t taken the plunge and picked up this app, what are you waiting for? At $0.99 this app is one of the best bargains in the app store, and every subsequent update is included in that price. At the rate this app is expanding, I predict that the price will go up eventually, so now is the time. It is certainly not going to get any cheaper. Look through the gallery below to see the updates that have come through since my last review. You can refer to my previous review to see updates that had come through before then. The meteor can pin an islander under it, or you can go bowling. I call my shark “Rex”. He likes to be fed regularly. Shark hats are all the rage on the island. 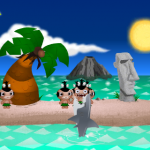 Drop the shark on an islander to make him more fashionable. Coconuts are good eatin’. Cracking them open is a little tricky. Islanders need plenty of rest. Plus it makes them stationary targets. Fireworks and dancing go hand in hand on the island. Beware the vampire! 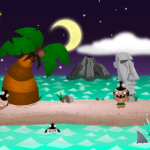 The islander bitten by the bat will roam the island destroying all in his path! Islanders love the sunrise. Except the vampire of course. Hey Chris! thanks for the awesome review. we just try our hardest, but I’m glad we are making an impact with people. Your effort shows. I’m looking forward to the next update. 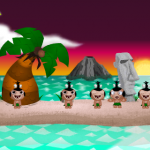 I have one friend who is now tempted to buy an iPod Touch simply because he loves Pocket God. How’s that for an endorsement? :mrgreen: :lol: Hey I have an iPod touch and all I do with it is play… POCKET GOD!! Who doesn’t love torturing little people?! I play that app more than I listen to music. For the creators I LOVE your app and your consistency! For the writer AWESOME review!!! Hey Chris, you sold me on Pocket God so I bought it last night… it’s a funny little app! Very creative stuff. I don’t see myself playing with it as much as Sam C. but Pocket God is cool and I’m looking forward to seeing what Bolt comes up with in future updates. Thanks for the compliment. Pocket God is easily my favorite app, and the one I most enjoy reviewing. I imagine I will be adding another updated review in another month or two. I don’t play it all the time either, but at $0.99 it is still a good price for a nice app. You can check out some images of the next update, “A Mighty Wind” at the Pocket Blog. New update out! This one allows you to create a tornado by moving your finger in a circle. On another note, Bolt Creative is running a contest to see who can make the best Pocket God Wallpaper. The winner gets a little Pocket God Statuette. You can see pics of the statuette and details on the contest at the Pocket Blog. There are a couple of new updates out. There are a lot of new things to do. 1. 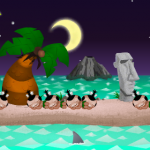 You can let your islanders fish, which they will eat. You can also pick up the fish and slap the islanders with it. 2. You can add an ant hill and a giant magnifying glass. 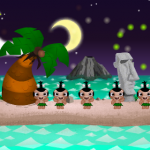 The ants can be drawn to an islander which they will devour, leaving just bones behind. The magnifying glass can burn ants or islanders, your choice. 3. You can name the islanders. You can also keep track of how much you torment them or gifts you give them. hey, i tried playing this game, and nothing happens, except you just throw little new zealanders around the place and break/destroy random things… there doesn’t seem to be a purpose or goal, unless i’ve missed something. most of the menu items don’t even work, and we are not even told under what condition they are supposed to work, nor are there any instructions. if it really is a “the sims 3” type game where there is no purpose, it is excrutiatingly boring and pointless, and im still in disbelief as to how people would pay money for this game. if it really is as it seems, it really speaks to the character of the people who play the so-called game and how boring and pointless their own lives are, to be entertained by such pointlessness. I’m sorry your incredibly meaningful life was interrupted by this app. A life so meaningful that you had to write an extensive comment on an 8 month old review, just to show that you couldn’t find the clearly visible question mark icon in the menu that would open the instructions, then insult everyone who enjoys this app. I’m sure you enjoy feeling superior to other people, but the simple fact is that you’re the first person to complain about not finding the instruction. How “superior” could you be? hey – thanks for the reply, never said i was superior to anyone, however i am a computer programmer and design of user friendly UIs are part of my work, i am merely suprised by how captivating this app could be where after ample time spent using it it neither captivated me nor impressed me slightly, which adds further to my confusion, on top of this, yet again, nothing happens & there doesn’t seem to be a point or a goal. its disillusioning and depressing to know that there are people that can get so excited over nothing. Once again, you can’t leave without throwing an insult at the people who like Pocket God. People, even intelligent people with meaningful lives, enjoy things that you may not like or even understand. Don’t try to throw credentials out there either, just because you are a computer programmer doesn’t mean you know squat about what people like or what that could possibly mean about their lives. So you don’t like Pocket God? Fine. That’s OK and I’m sure there are many out there who agree. Don’t go around judging and insulting people because of how they choose to pass a few minutes of their own time. Feel free to say whatever you like about how much you dislike Pocket God, but keep the insults to yourself. Don’t fool yourself about your own sense of superiority. Why lament about other people’s “meaningless” lives if not to congratulate yourself on how comparatively meaningful your own life is? Why talk about how depressing it is that others get exited over nothing except to feel good about how intelligent you must be to be able to see the truth? Deny it if you want, you’ve already made it clear. hi chris, sorry but you are making overly simplified textbook interpretations of my reaction which in some senarios may be true but not in all, i know it’s not the nicest way to start a thread but i was mainly trying to figure out what it is about this app which captivates people while wanting to understand what it is that i’ve missed (if i have missed something that is). Uhhh how about we all just agree to disagree? :? I don’t think you missed anything… some people like certain apps and others don’t. Again, agreeing to disagree. People like different things and that’s ok! That’s all I’m going to say on this subject. when is the next update comeing?!?!?!?!?! Do u think 'Randy Orton is one of the greatest wrestlers ever' is the lamest push by WWE this year? Why?